Sage advice, to be sure, and one wonders if Scotland’s First Minister, Nicola Sturgeon, is familiar with the quote. If so, we can imagine her nodding in resigned agreement at the end of an extraordinary week. She was branded by the Daily Mail as “The Most Dangerous Woman in Britain” – surely a badge of honour, awarded as it was by the notorious Hitler-worshipping rag? – and then wowed even English voters during the leaders’ debate on Thursday evening, topping the many resulting polls. The events that followed, then, represented a certain inevitability. The SNP oppose austerity, oppose the scape-goating of immigrants and oppose the destruction of free education and the NHS. As someone remarked, in these reactionary times, that’s virtually the transitional programme. Crucially, the SNP have tacked left under Sturgeon’s leadership and are now even more opposed to the establishment’s austerity consensus. Added, of course, to the party’s determination to see the end of the British state, as it is currently constituted, and their not insignificant commitment to ridding Scotland of Trident. Something it is inconceivable to imagine leaves the Brit state’s bosses on the other side of the Atlantic in a mood of unruffled equanimity. Fitting, then, one supposes, that the Telegraph gives us a 2015 cover version of the Zinoviev affair. We can only imagine Dacre and the Daily Mail are kicking themselves for not thinking of it first. The allegation that the First Minister told French diplomats she would prefer a Tory government to one headed by Ed Miliband has, by now, been so comprehensively debunked as to be worthy of little additional commentary. What is worthy of further scrutiny, however, are the motives behind what is clearly a state-orchestrated fit-up and the reactions to it of, most especially, Scottish Labour. It is mooted that the smear is plausible because, from a strategic point of view, a Tory government would actually suit the SNP. The thinking is that five more years of Cameron’s Eton Rifles hammering the poor and rolling out further punitive austerity measures would drive even more sickened and desperate Labour supporters into the arms of the SNP. It’s nonsense on two counts. Firstly, the SNP’s primary objective is independence from the UK. That is far more likely to be achieved – or rather significant concessions towards it – with a battalion of SNP MPs twisting Miliband’s arm behind his back, in exchange for SNP support in a hung Westminster parliament, than it is by trying to get another Holyrood-organised referendum off the ground less than a year after the last one. Secondly, given the polls unanimously predict an SNP wipe-out of Labour’s branch office in Scotland, who would really believe the SNP would counter such a bonkers strategy just for the sake of mopping up a few more disgruntled Labour voters? The counter to this is: ah yes but the SNP threaten the Labour vote not the Tory vote! 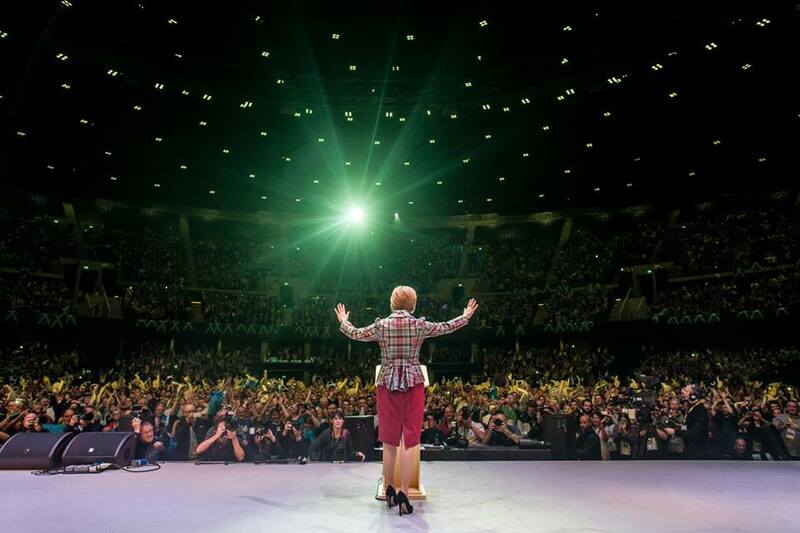 How does framing Nicola Sturgeon as a Tory stooge benefit the Tories and why on earth would they be unhappy with Labour losing votes to the SNP? Such a question is beyond naïve. We’re talking far bigger stakes than mere party politics. We’re talking the break-up of the Brit state, the ejection of UK, ergo US, nuclear weapons from Scottish soil. And, of course, the shattering of the establishment’s austerity consensus of which Labour, in both its Anglo and Scottish expressions, is a crucial part. Labour is, not to overstate the case, an important plank of the Brit state’s self-defence mechanism and, in this sense, the Tories’ junior partner. Finally, and feel free to fire accusations of naivety right back at this writer, Sturgeon and the bulk of the SNP are conviction politicians. No one is suggesting that they are the Bolsheviks reincarnated; indeed Richard Seymour makes the not unfair suggestion that the party shouldn’t even be labelled as ‘left’ but rather ‘progressive’. But for all that, on an essentially human level, Sturgeon represents a streak of decency and integrity almost extinct in British politics. No, what we have here is a vengeful and frightened Brit state lashing out at its biggest threat. Project Fear: Part Two is well underway and there will be more to come. An uppity, lefty, female Jock having the cheek to take on the Brit state? We can be sure the Sir Humphreys are already massing. Great article, Harry. Interesting times indeed. PS Hope the Wasps have a great day out today! If any man said, “hen” to me I’d want to bop them on the nose, it’s so patronising. I’m only mentioning as it utterly ruins another great article, because it couldn’t be less progressive or appealing. On balance, in the cold light of (sober!) day, I think you’re right. It was intended to be an ironic commentary on the undoubted outraged sensibilities of the Westminster patriarchy and I thought it followed on nicely from the previous “uppity, lefty, female Jock” comment. This morning, however, sans whisky, I cringed myself, on re-reading it. It didn’t work at all in the way I imagined it did last night. Thanks very much for taking the time to write. I appreciate your feedback. I’ll delete it and publish your comment.